Monroe Girl Scout troops participate clean up day. Some girls from the Brownie Troop in Monroe joined forces with some of the girls in the Daisy Troop one morning and went out to clean the Monroe Community Park. The girls were greeted by Mayor Routson who thanked them. He was so impressed he gave them all a very nice pin for their sashes. The Monroe Brownies learned about littering, keeping our earth clean and giving back to our community. Most of all the Girls all had a fun time. This activity was used to meet the criteria for our Daisy Troop (Kindergartners) to become Brownies! They are planning a ceremony to take place this summer. 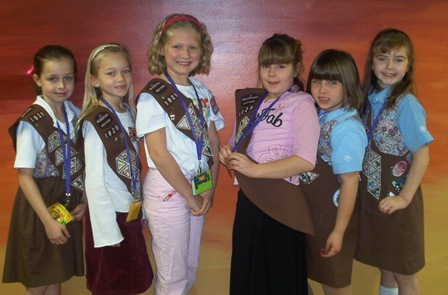 From L to R: Jennifer H. Tarin Y. Maddie H. Taylor C. Jessica M. Katie B.
Maddie took part in a religous study program offered by Girl Scouts and earned her "Family of God" medal. Our troop is very proud of Maddie and her accomplishment. We also have 5 or 6 more girls who will be receiving their medals during this coming summer.